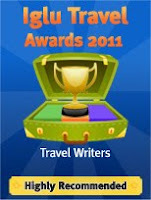 There's still time to enter Quark Expedition's Blog Your Way to the North Pole travel writing contest. "..post a short essay (200 to 400 words) on this website. Tell us why you qualify to be Quark's Official Blogger to the North Pole. The 400 words must also include a short story about a unique trip or travel experience you've taken, as well as your photo. Then, reach out to your social networks to get the most votes." An amazing prize is on offer - a trip for 2 to the North Pole aboard the world's most sophisticated and powerful nuclear-powered icebreaker. Airfare from the winner's nearest international gateway, as well a charter flight from Helsinki, Finland, to Murmansk, Russia, is also included. However, the contest closes on 15 February 2011, so there's not much time left to post an award winning entry and also get the thousands of votes need to be in the running. Alternatively, you could just cast your vote and help someone else win. That's what I'm going to do. Here's my pick...travel writer and photographer Lola Akinmade who took part in the Write to Travel 'interview with a travel writer' series back in 2008. Lola entered the contest a few months ago and is currently in the top 5 most popular posts.